If you travel with a lot of expensive camera, video, or music gear, there’s a good chance you stuff it all in a Pelican case to ensure it arrives unscathed. The company is known for its nearly indestructible cases, and now that it’s made a cooler, you’ll never have to worry about something happening to your drinks. 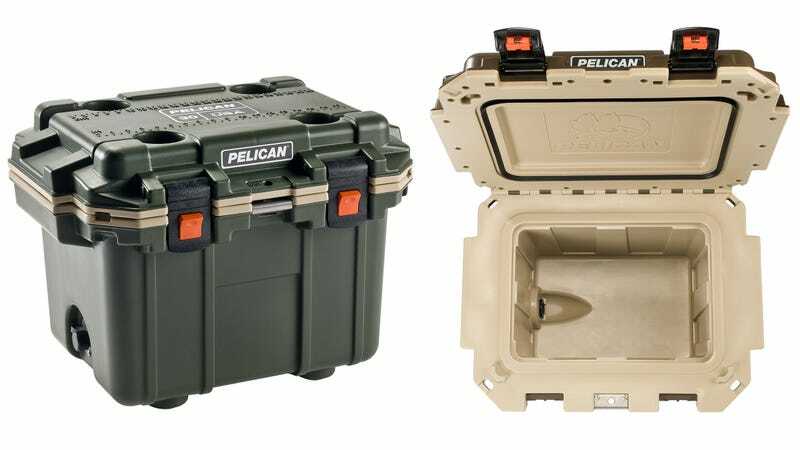 Outfitted with locking latches that will foil everything from a raccoon to a bear, the Pelican Elite cooler also features freezer-grade seals and extra-thick insulation to keep everything inside chilled for as long as possible. Drop it off a cliff and the cooler will not only survive, but your beers will still be cold by the time you climb down to rescue it. Available in two capacities—30 quarts for $275 and 70 quarts for $400—the Elite also comes in four different color combos, includes a drainage spigot, cup holders on the lid, and a bottle opener tucked under its rim. And there’s no reason you can’t also use it to transport expensive gadgets when filled with enough bubble wrap to stop your toys from bouncing around.